When Gerry Gerntholz met his future wife, Marian, in college at North Dakota State University in Fargo, ND, she already loved Dakota Boys and Girls Ranch. "The Ranch touched Marian's heart, even back then," Gerry said. "I think Marian learned about the Ranch through her church about the time the Ranch was started. Her love carried through after we were married. Every time she saw something about the Ranch, or we drove through the gates on the Minot campus, she cried for the children." 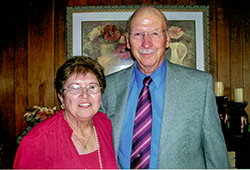 Gerry said the Ranch grew on him, and he and Marian supported its work as much as they were able. "Even when we were young and couldn't afford much, Marian always put something in the envelope for the Ranch when it came in the mail," Gerry said. Gerry eventually joined the Dakota Boys and Girls Ranch Foundation board of directors at the recommendation of a friend, and now has been on the board for 14 years. When asked why he continues to support the Ranch, Gerry said, "All kids have challenges, but some really have some tough ones. Oftentimes their parents aren't able or willing to give them what they need. The Ranch gives these kids something to hold onto-faith, a way of life, a way of working with people-and gets them out of the hole they are in." When Marian died 18 months ago, Gerry wanted to do something special in her memory. He gave a portion of her life insurance proceeds to the Ranch. "The Ranch wasn't listed as a beneficiary on her life insurance, but I thought about how Marian would have wanted it spent. 80% went to our children and 20% to the Ranch." Gerry designated the dollars to the Hope in the Heartland campaign, to support the building project in Fargo. In turn, the Narthex in the Fargo chapel will be dedicated to the glory of God and named in memory of Marian Gerntholz. When people see Marian's name on the wall of the Fargo Chapel Narthex, Gerry would like them to remember her strength, her independence, and her kindness. "She was a strong lady," he said. "She was a people person, and she had a heart of gold."